Never before in my running career (except in high school) have I raced as much as I have this summer. It was 100% unintentional, but somehow I have found myself at several start lines (with more to come…). It helped that two of these races were free. Actually who am I kidding…that’s more or less the reason I’ve done so many. But free or not, I love racing, and I’m really happy to get the chance to do more of it. I’m really trying to use the chance to race in the heat to my advantage, despite how much I dislike it. I’m 100% a cold weather racer, always have been, and I have always felt defeated a little when the temperatures rise and my speed and energy decline. But, I’m trying to turn this into a positive and hopefully by doing the hot work now, it will make the cooler temps all the more luxurious. So let’s get this race recap started already, shall we? 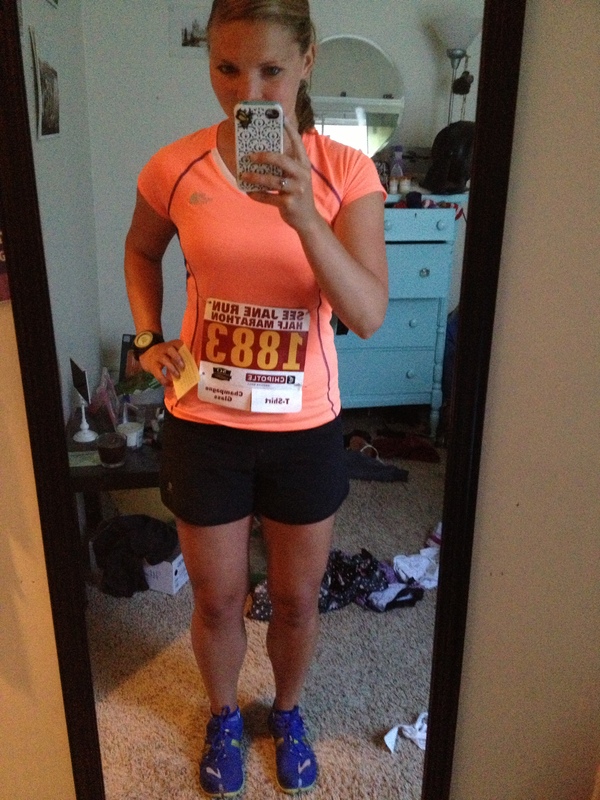 Pre-race mirror selfie + dirty room. I did something I have never done before a half before this race—I warmed up. Not far—just a little half mile jog with a couple of strides to get my legs warm and my turnover going. I was a little wary of not storing all my energy, but I actually really liked this and I started the race feeling more ready to go than usual. After said warm-up, I scuttled my way to the first corral and right at 8 am, we were off. I immediately felt really happy to be racing a half on such a beautiful day with a bunch of runner gals. Despite how competitive I am (which would be proven later on), there was something great about racing among a (primarily) all-female group. There’s this unspoken sisterhood between ladies who run, and I could definitely feel it crossing the start line on Sunday. Well, my “guideline” number 1 was kind of blown, but I figured that this would just make guideline number 2 even tougher and thus make guideline number 3 a success. I couldn’t help starting this way—I felt so good! But eventually, once reality settled in, I dialed it back a bit and focused on getting into a groove. The beginning miles of this race are all along Lake Union and the canal, so there was a lot of shade and a nice breeze. It was very comfortable running, and once the crowds thinned a little I really felt in a groove. There was an out-and-back after mile 3 or so, and I quickly realized that the mile markers were very off. I verified this when I heard some gals around me comparing their own measurements, but I figured it would all settle itself eventually. These are the miles where a half-marathon starts to get more real for me—kind of like miles 14-18 of a marathon. The middle miles. The miles you forget about until you’re in them and you realize you’ve already run for an hour or so but you still have the harder stuff left. Luckily, I was still feeling good—a little hot, but luckily we were still reasonably shaded. I was also having a grand ole time targeting and leap-frogging with other runners. I knew I was in the top 30 or so women, meaning that it was safe to assume that everyone around me was down for some racing. I definitely noticed a little sass between runners during this race, especially when I would pass someone— but in a good competition kind of way. Anyway, it made it fun and offered some distraction. Around mile 7 I felt like I was primarily passing people as opposed to getting passed, which gave me some hope that all my goals going into this race weren’t lost. Around mile 7 was the dreaded “super steep” hill on the course. It was definitely steep and slowed me down, but it wasn’t awful. This is where the only hills in this race were, but they didn’t bother me too much. With every uphill comes a downhill, and as much as the uphills can drain my energy, I always gain momentum on the way back down. We passed back by Gasworks and the finish line on the way to the final out-and-back, which was a little deflating, however I was prepared for it and didn’t actually mind as much as I anticipated. I should also note that the mile markers were still off, and I was pretty certain around this point that the course would end up short. Kind of a bummer, although ultimately we would all be running the same distance. Good thing I wasn’t going for a personal best, but this seems like something that should definitely be fixed next year. 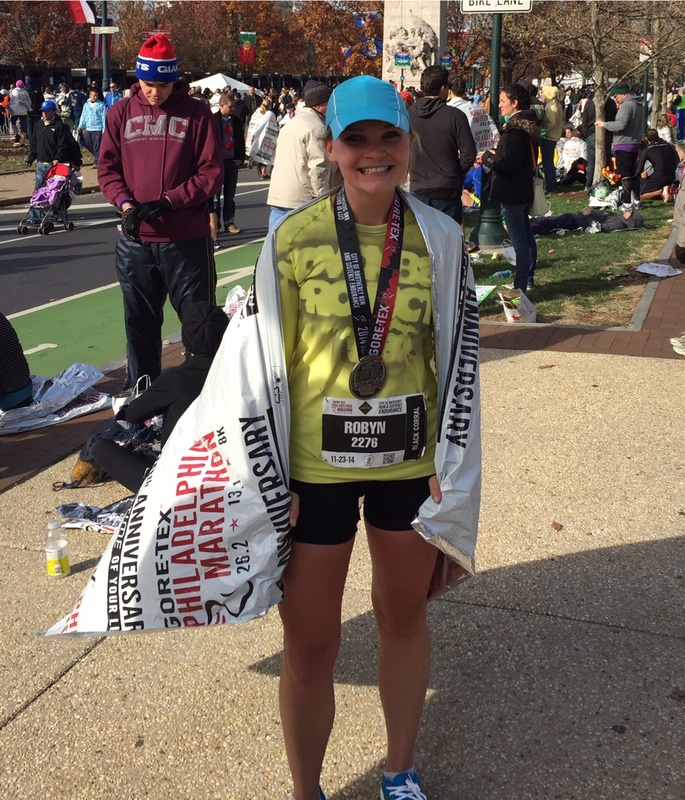 I was getting warmer and my stomach started to squirm a little around mile 10. Heat does this too me—especially if my fuel isn’t sitting properly (which it wasn’t). I tried sucking on a Honey Stinger gel packet around 8.5, and despite my best efforts it wasn’t going to happen. I need to get better at fueling somehow. Nearing mile 11, I was dreading my self-proclaimed “fast finish,” but I was also excited to try and gut it out with a few of the girls around me. This part was also exciting because we were able to see the lead ladies coming back by us, and the first gal (who was crushing everyone) was SO YOUNG. I think she may have been 14-16 years old? Ridiculous. I gave her an obligatory, “You go girl,” as she sprinted by me. My watch read 1:40:06 when I finally finished, which was too bad, but since I was sure the course measurement was wrong anyway, it didn’t matter too much. Also, duh, this wasn’t a goal race, so I was mainly just happy to be done and to have (mostly) accomplished what I wanted to. The finishing area was fun, with lots of samples and not enough hands to hold it all. My stomach was still waging war, so after one failed attempt at a donut hole I had to refuse all the other goodies. I felt better after two bottles of water, but I just don’t think my system will ever get used to racing in warmer temps. It’s all part of the training though. And this race was exactly what I wanted in terms of race practice and getting into a manageable pain place. Oh and I started wearing sunglasses when I run. LOVE. Age Group: 6/171 <— homegirls are FAST! The next closest girl to me ran a 1:34. Overall, I was happy with this race. It felt challenging but not too hard, and while the thought of averaging a pace 30 seconds faster than this in just over two months is still horrifying, I’m thankful for the opportunity to practice racing the distance. I also know there’s lots of time before Bellingham, and I have some strategies up my sleeve to help my 1:35 goal become a reality. More to follow later on. See Jane Run will, however, more than likely be my last half before that goal race, which I’m hoping will help to kindle some necessary race-day fire. Special thanks to RoseRunner for my entry to this race! And now…let’s run some ultra relays! Did you run See Jane Run? How did it go?? 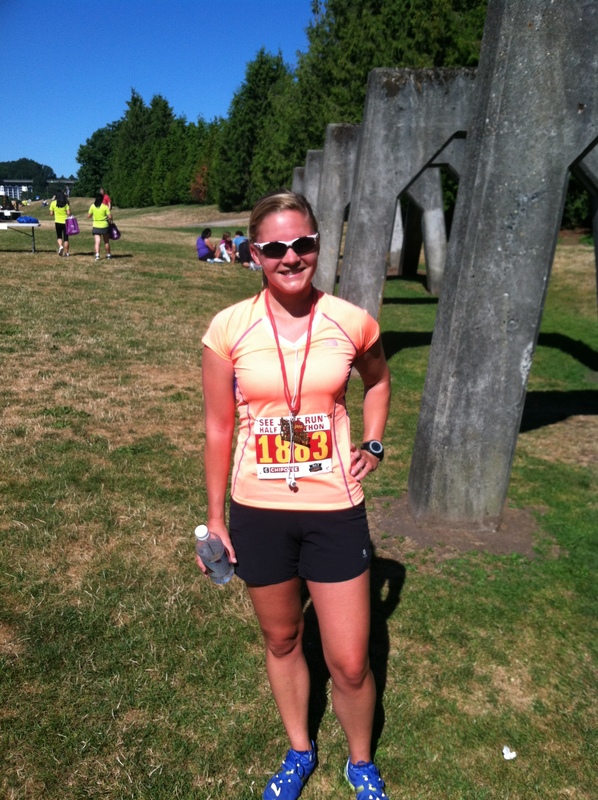 This entry was posted in Half Marathon, Race Recap and tagged half marathon, race, race recap, running, Seattle, weather on July 17, 2013 by runbirdierun. Way to go. I’m impressed by your speed and your ability to keep that speed in a warm race. I’m normally not a huge fan of out & backs during a race but I didn’t mind them in this race since I got to see speedy gals like you, which is always inspirational. The girl who won the race is 16 (!). Totally agree about the out and backs…normally dislike them, but it was fun to see people. I can’t believe she was 16! This is the summer for races all right. I also have never had so much on my plate before. Glad you had a great race. Fun that you got to high five your BF at the finish. I ran a very similar time in Missoula w/ the same goals in mind. The homegirls were fast there too. I was 11th in my AG! Congrats!! I did the 5k…came in 8th in my AG which was really cool 🙂 I did not see any doughnut holes at the end of the race! !